Gelato Messina, the gelato store making a name for itself world wide, has recently opened on Melbourne Street South Brisbane just a short stroll from South Bank Parklands, with a store as stunning in appearance as their range of 40 gelato flavours. Gelato Messina make fabulous gelato using only real ingredients of the highest quality. Fake ingredients, colourings, flavourings, preservatives and pastes are unheard of at Messina. Everything is made in-house and from scratch from the baking of their own brownies to stewing their own spiced rhubarb. Their dairy flavours have a low fat content because they use less cream and their sorbets are completely fat free, dairy free and full of fruit. Gelato Messina believe that by using real ingredients they achieve full bodied texture and flavour in their gelato. We visited the new store during the school holidays and were impressed by the very high ceilings, brown and burnt orange colour scheme and stunning art deco inspired interior complete with bean bags and bench seating. The serious business of deciding which flavour gelato to have was very difficult with 40 flavours to chose from ranging from Salted Caramel and White Chocolate Chip to Caramel Popcorn to Chocolate Fondant to Mango to Pandan and Coconut to Lychee Sorbet - to name a few! Once we had decided and eaten our gelato we all agreed that it was incredibly creamy and delicious albeit melting quickly which can be attributed to the natural ingredients that are used in the creation process nevertheless we were happy to lick quickly to ensure that we didn't waste any of the deliciousness. Staff were friendly, helpful and more than happy for us to sample as many flavours as we wanted. We were even invited to taste the sorbet special of the day that the kitchen was in the process of making. 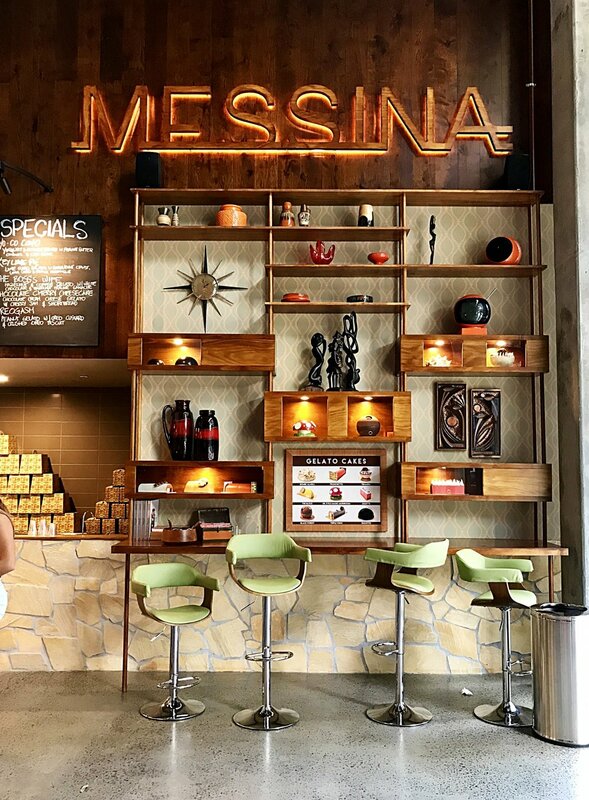 As the store is new and only accepting cash sales for now, try paying for your gelato with the Gelato Messina App. This is a quick process which actually earns reward points that can be used towards gelato, events and merchandise. A visit to Gelato Messina is well worth the effort of finding a park if you intend to drive, the creamy deliciousness of the gelato and incredible range of flavours made from all natural ingredients will have me returning time and time again to ensure that I have taste tested every flavour creation available - better keep up my running then! Let me know which is your favourite flavour combination. Where - 109 Melbourne Street, South Brisbane.